Pulmonary alveolar proteinosis (PAP) is a syndrome caused by defects in the generation or degeneration of surfactant that lead to abnormal accumulation of surfactant-derived material in the alveoli and terminal bronchioli. 1) Pathologically proven abnormal accumulation of surfactant-derived material in the alveoli and terminal bronchioli. 2) Lesions that are typically diffuse and bilaterally distributed radiologically. 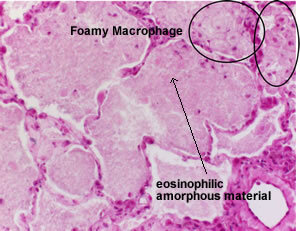 The appearance of bronchoalveolar lavage fluid (BALF) is “milky” or “waxy”. Upon standing, it forms sediment. Electron microscopy of BALF sediment shows the presence of lamellar bodies and fused membrane structures. Microscopically, alveoli and terminal bronchioli are filled with a fine eosinophilic material stained strongly for surfactant proteins with periodic acid-Schiff reagent. The alveolar wall and interstitial architecture are relatively well-preserved. Chest HRCT typically shows ground glass opacification (GGO). The image to the left is a 3D HRCT image of GGO distribution in PAP. Congenital PAP is caused by congenital defects in the surfactant generation or degeneration process. Deficiency or mutation of granulocyte macrophage colony stimulating factor (GM-CSF) receptor α or β, surfactant protein B or C, or ATP-binding cassette transporter A3 have been reported as causes of congenital PAP. In most cases, however, the cause is unknown. In congenital PAP, serum is negative for GM-CSF autoantibody. The incidence of congenital PAP is unknown. Most cases originally diagnosed as primary or idiopathic PAP have been shown to be positive for GM-CSF autoantibody. The presence of GM-CSF autoantibodies in pathologically proven PAP is termed autoimmune PAP, and constitutes 90% of PAP. Except for congenital or secondary causes, cases of PAP in which the occurrence of GM-CSF autoantibody is unknown is deemed idiopathic PAP until further examination demonstrates otherwise. Secondary PAP develops secondarily to hematological disorders (especially myelodysplastic syndrome), pulmonary infections (pneumocystis pneumonia and non-tuberculous mycobacteriosis), and some autoimmune diseases (e.g.,Bechet disease), and constitutes 6% of PAP. Serum is negative for GM-CSF autoantibody. PAP other than 1), 2) or 3). In normal lung, GM-CSF released from alveolar type II cells binds to GM-CSF receptors on immature alveolar macrophages and initiates GM-CSF signaling in these cells. This promotes the expression of transcription factors, PU.1 and PPARγ in the nuclei and triggers the terminal differentiation of alveolar macrophages into mature macrophages that maintains homeostasis in the lung by incorporating and degrading surfactant lipids and proteins. In autoimmune PAP, GM-CSF released from alveolar type II cells is neutralized by abundant GM-CSF autoantibodies present in the alveoli. This prevents GM-CSF from binding to GM-CSF receptors on immature alveolar macrophages. 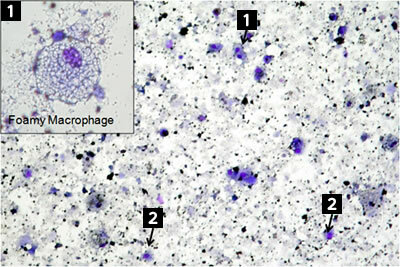 Consequently, terminal differentiation of alveolar macrophages does not occur, thus impairing surfactant catabolism in the lung. from Japan Agency for Medical Research and Development, AMED.